Flower Clip art is widely used for decoration purpose whether it is an invitation card for Christmas or a greeting card for a new year. Or any other decoration project that you are planning. It not only gives the essence of nature to your project but makes it’s more beautiful and appealing to your recipient too. 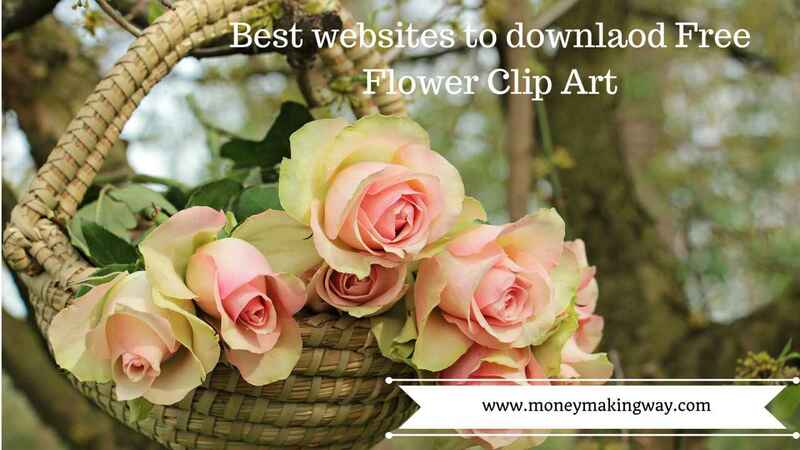 There are tons of websites who are offering free Flower Clip art but the biggest challenge is to find the one who has varieties of flowers with high-quality of images. And we have reviewed many websites either you will end up with a string attached or if they are free then the quality of images is not good. Some websites had good quality free images but they were lack of varieties. Here we will share the list of websites which are good in all spheres. Check out some more Clip Arts for your decoration projects. Following are the websites for Free Flower Clip Art. Classroom Clipart has varieties of flowers including Lotus, Tulips, sunflowers, Rose, Lily, Lavender, zinnia, petunia, pansy, calendula, marigold, snapdragon and much more. But you will find some images with watermarks at the bottom. Whereas most of the images are free from watermarks and are available with high-quality images. No account registration is required in order download and sites provide many other different types of clipart such as plant, animal, medical, school, history, and science. The download file is available in JPG format. Hellasmultimedia is also a great website for any kind of clip art that you are looking for your decoration project and they also have a great collection of flower clip art. They have many other categories of flowers which you can explore to make your projects look more beautiful. Such as flowers with border, flowers with backgrounds and lines with flowers. Their collection includes various types flowers including roses basket, pink flowers, tulips, sunflowers, bouquet with multicolors and many other types of flowers. Vecteezy is one of the largest vector graphics community in the world and has millions of collection of various types of clip art. They also have various types of flower clip art such as Lotus, Canola, protea, mimosa, Polynesian, Vanilla, spring flowers, and many other flowers which would definitely add beauty to your projects. You would also find some other types of flower clip art like flowers backgrounds, flower borders, and geometrical flowers. No Registration required and you can download the image just by saving the file with a right click. Download file would available in JPG format. Clipart Library has limited numbers of free flowers clip art but all of them are good and unique. As compared to many other websites the quality of images is really great. You can also explore some clip art like Happy birthday art, winter coat, Simley, Halloween, animals, and Football player. All files are available in JPG format. They have 173 flower clip art comprising of various types of flowers. Including tulips, rose, sunflower, hibiscus, and many other which would perfectly compatible with your decoration projects. User registration not required simply download the image with right click. Clipartpanda is also a good source of other clipart like Christmas, Batman, Ironman and Christmas tree. Flower clip art is a good way to give a nature appearance to our letter, invitation cards, and flyers. But it is really important that clip art which we are going to use for our decoration projects should have high quality else the image would get fade while taking printouts. Or even if you are using this for your online projects it won’t look good. Usually, you would find that websites which are offering free clip art do not have good quality. But there are few websites who not only provide free clip art but also maintain the quality standard. So check out our compile list and share with your friends and family.